تیموری فعال, رضا, پورسیفی, مهدی. (1396). بررسی مد ترکیبی مکانیک شکست در استوانه ایزوتروپیک نامحدود تضعیف شده توسط چندین ترک استوانه ای. نشریه پژوهشی مهندسی مکانیک ایران, 19(1), 34-60. رضا تیموری فعال; مهدی پورسیفی. "بررسی مد ترکیبی مکانیک شکست در استوانه ایزوتروپیک نامحدود تضعیف شده توسط چندین ترک استوانه ای". نشریه پژوهشی مهندسی مکانیک ایران, 19, 1, 1396, 34-60. تیموری فعال, رضا, پورسیفی, مهدی. (1396). 'بررسی مد ترکیبی مکانیک شکست در استوانه ایزوتروپیک نامحدود تضعیف شده توسط چندین ترک استوانه ای', نشریه پژوهشی مهندسی مکانیک ایران, 19(1), pp. 34-60. تیموری فعال, رضا, پورسیفی, مهدی. بررسی مد ترکیبی مکانیک شکست در استوانه ایزوتروپیک نامحدود تضعیف شده توسط چندین ترک استوانه ای. نشریه پژوهشی مهندسی مکانیک ایران, 1396; 19(1): 34-60. تحلیل تنش یک استوانه ایزوتروپیک تضعیف شده توسط چندین ترک استوانه ای هم محور با استوانه و تحت بارگذاری برشی و شعاعی بر روی سطح جانبی استوانه، در این مقاله مورد بررسی قرار می‌گیرد. در ابتدا حل نابجایی های سومیقلیانا و ولترا در استوانه با استفاده از حل گلرکین برای مسائل متقارن محوری بدست می‌آید. سپس با حل عددی معادلات انتگرالی که دارای تکینگی از نوع کوشی می باشند، دانسیته نابجایی های سومیقلیانا و ولترا روی سطوح ترکها محاسبه می گردد. با استفاده از دانسیته های نابجایی، ضرایب شدت تنش مدهای اول و دوم در چندین مثال بدست می آیند. Farris, T. N., Kokini, K., and Demir, I., “The Cylindrical Crack”, Journal of Applied Mechanics. Vol. 56, No. 4, pp. 981-983, (1989). Demir, I., Hirth, J. P., and Zbib, H. M., “The Extended Stress Field around a Cylindrical Crack using the Theory of Dislocation Pile-ups”, International Journal of Engineering Science, Vol. 30, No. 7, pp. 829-845, (1992). Zbib, H. M., Hirth, J. P., and Demir, I., “The Stress Intensity Factor of Cylindrical Cracks”, International Journal of Engineering Science, Vol. 33, No. 2, pp. 247-253, (1995). Close, S., and Zbib, H. M., “The Stress Intensity Factors and Interaction between Cylindrical Cracks in Fiber-matrix Composites”, Studies in Applied Mechanics, Vol. 44, pp. 3-27, (1996). Itou, S., “Stresses around a Cylindrical Interface Crack under Shear”, Engineering Fracture Mechanics. Vol. 36, No. 4, pp. 631-638, (1990). Dhaliwal, R. S., Saxena, H. S., He, W., and Rokne, J. G., “Stress Intensity Factor for the Cylindrical Interface Crack between Nonhomogeneous Coaxial Finite Elastic Cylinders”, Engineering Fracture Mechanics, Vol. 43, No. 6, pp. 1039-1051, (1992). Xue-Li, H., and Duo, W., “The Crack Problem of a Fiber-matrix Composite with a Nonhomogeneous Interfacial Zone under Torsional Loading Part I. A Cylindrical Crack in the Interfacial Zone”, Engineering Fracture Mechanics, Vol. 54, No. 1, pp. 63-69, (1996). Itou, S., and Shima, Y., “Stress Intensity Factors around a Cylindrical Crack in an Interfacial Zone in Composite Materials”, International Journal of Solids and Structures, Vol. 36, No. 5, pp. 697-709, (1999). Itou, S., “Stress Intensity Factors for a Moving Cylindrical Crack in a Nonhomogeneous Cylindrical Layer in Composite Materials”, Archive of Applied Mechanics. Vol. 75, No. 1, pp. 18-30, (2005). Li, C., and Weng, G. J., “Dynamic Stress Intensity Factor of a Cylindrical Interface Crack with a Functionally Graded Interlayer”, Mechanics of Materials. Vol. 33, No. 6, pp. 325-333, (2001). Feng, W. J., Su, R. K. L., and Jiang, Z. Q., “Torsional Impact Response of a Cylindrical Interface Crack between a Functionally Graded Interlayer and a Homogeneous Cylinder”, Composite Structures, Vol. 68, No. 2, pp. 203-209, (2005). Li, Y. D., Zhao, H., and Xiong, T., “The Cylindrical Interface Crack in a Layered Tubular Composite of Finite Thickness under Torsion”, European Journal of Mechanics-A/Solids. Vol. 39, pp. 113-119, (2013). Lurʹe, A. I., “Three-Dimensional Problems of the Theory of Elasticity”, Interscience Publishers, (1964). 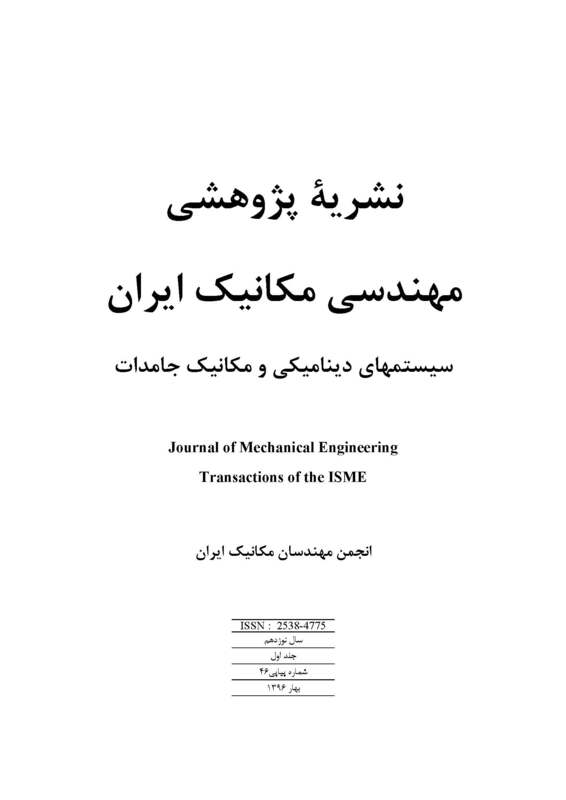 Faal, R. T., Fariborz, S., and Daghyani, H. R., “Antiplane Deformation of Orthotropic Strips with Multiple Defects”, Journal of Mechanics of Materials and Structures, Vol. 1, No. 7, pp. 1097-1114, (2006). Erdogan, F., “Stress Intensity Factors”, Journal of Applied Mechanics, Vol. 50, No. 4, pp. 92-1002, (1983). Kasano, H., Matsumoto, H., and Nakahara, I., “A Torsion-free Axisymmetric Problem of a Cylindrical Crack in a Transversely Isotropic Body”, Bulletin of JSME. Vol. 27, No. 229, pp. 1323-1332, (1984). Gordeliy, E., and Detournay, E., “Displacement Discontinuity Method for Modeling Axisymmetric Cracks in an Elastic Half-space”, International Journal of Solids and Structures. Vol. 48, No. 19, pp. 2614-2629, (2011).